Just in time for the holidays my favorite skin care line Nerium International presents super fun holiday bundles! I am so excited to tell you about their limited-edition bundles. BONUS: Each of the three Holiday Bundles comes with a FREE travel bag filled with three pairs of its innovative Eye-V™ Moisture Boost Hydrogel Patches! The bundles available are the Wash & Glow Bundle, the Revive Your Eyes Bundle, and the Daily Vitality Bundle. Keep reading to learn all about all three bundles. Perfect for yourself this holiday season or anyone on your shopping list. Wash and Glow Holiday bundle features two of our newest skincare stars, IllumaBoost™ Brightening & Shield and Double-Cleansing Face Wash. Perfect for giving, or treating yourself. Take the hassle out of holiday shopping - Nerium International can send gifts directly to the recipient. Hurry! Quantities are limited! IllumaBoost™ Brightening & Shield- Innovative booster amplifies your skincare regimen by adding ingredients to your existing products that help brighten, hydrate and guard against environmental stressors. Featuring both Age-Defying Eye Serum and Eye-V Patches, our Revive Your Eyes Holiday Bundle is the brightest gift EYE-dea of the season. 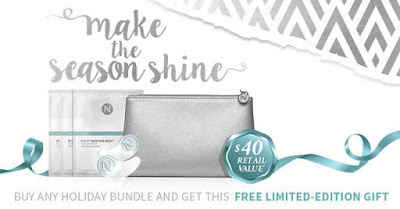 Take the hassle out of holiday shopping – Nerium International can even send bundles directly to the recipient. Age-Defying Eye Serum- This transformative serum delivers both short- and long-term benefits for the appearance of smoother, younger-looking eyes. Powered by our exclusive SIG-1191™ and I-FIL4R™ ingredients, it firms and brightens while fighting the appearance of dark circles, puffiness, wrinkles and fine lines. Take the hassle out of holiday shopping - Nerium International can send gifts directly to the recipient. Hurry! Quantities are limited! Youth Factor™ Complete Vitality Complex- Holistic daily supplement’s ingredients work at the cellular level to help support optimal function, maintenance and repair of your body, inside and out. Youth Factor™ Superfood & Antioxidant Boost Powder- Daily use powder featuring body-fortifying antioxidants and hearty servings of fruits and vegetables to help boost your body into its optimal state of wellbeing. Nerium International’s Holiday Bundles are perfect for everyone on your gift list, and a great way to treat yourself. It’s an easy way to wrap up your holiday shopping, and gifts can be sent directly to recipient.